April 13, 2016, 12:11 p.m.
Twitter generates 1.5 percent of traffic for typical news organizations, according to a new report from the social analytics company Parse.ly that examined data from 200 of its client websites over two weeks in January. (You’ll need to give Parse.ly your email address to access the full report.) 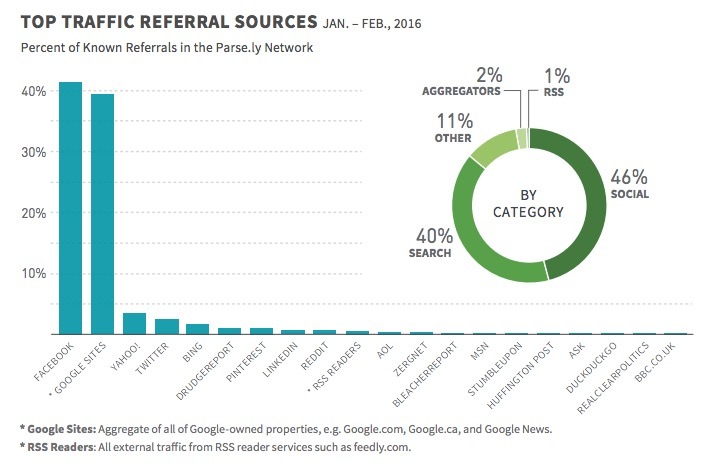 Parse.ly’s network includes publishers like Upworthy, Slate, The Daily Beast, and Business Insider. The median publisher saw roughly 8 tweets per post, 3 clicks per tweet, and 0.7 retweets for each original tweet, Parse.ly said. The top five percent of publishers performed better on Twitter, averaging 11 percent of their traffic from the network. There is no “secret sauce” for digital publishers looking to improve their success on Twitter. Sites that are doing well on the platform — achieving high levels of engagement — are not necessarily the most active; rather, they are sites that are producing interesting and shareable content that appeals to a large number of people. Typical content on Twitter tends to be conversational in nature, with thousands of people engaging with a particular topic for an extended period of time. Breaking news stories, on the other hand, often drive large spikes in traffic over shorter periods of time. The 2016 presidential election is an example of a conversational topic that generates ongoing reporting and discussion. In March, there were 1.9 million tweets with links to news coverage about the race in its network, the company said. Election tweets made up more than 6 percent of all the tweets Parse.ly studied in March. Last month’s terrorist attacks in Brussels, meanwhile, demonstrated how breaking news spreads on Twitter. More than 92,000 tweets with links to stories on the attacks were posted within the first 24 hours after they occurred, according to Parse.ly’s data. About a third of those tweets were sent within the first six hours after the attacks. Lichterman, Joseph. "Twitter has outsized influence, but it doesn’t drive much traffic for most news orgs, a new report says." Nieman Journalism Lab. Nieman Foundation for Journalism at Harvard, 13 Apr. 2016. Web. 18 Apr. 2019. Lichterman, Joseph. "Twitter has outsized influence, but it doesn’t drive much traffic for most news orgs, a new report says." Nieman Journalism Lab. Last modified April 13, 2016. Accessed April 18, 2019. https://www.niemanlab.org/2016/04/twitter-has-outsized-influence-but-it-doesnt-drive-much-traffic-for-most-news-orgs-a-new-report-says/.